a group concerned about the protection of the natural and cultural values of Big Sur. Currently over 250 members of the Big Sur community are supporters of the Defense Committee. There are few places in the world that have been subject to more thoughtful and passionate efforts directed towards preservation of its natural and cultural values than Big Sur. 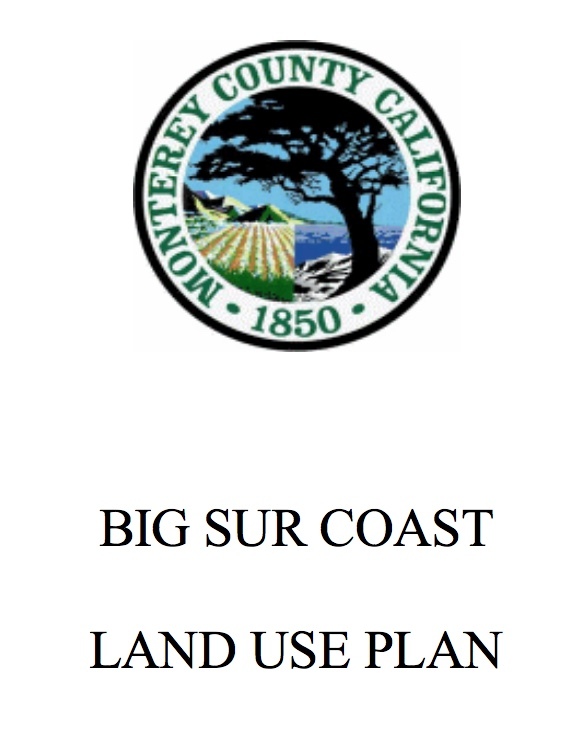 The legal document in place to accomplish this is the Big Sur Land Use Plan. The Coastal Act of 1974 include provisions for the protecting of public access and the protecting of the cultural and natural resources of the Big Sur Coast. The Big Sur Local Coastal Program of 1985 implements some of those provisions. Unfortunately there are reasons to believe that local Government is unable to to uphold and enforce some of the most important of these provisions thereby threatening to dramatically undermine the Big Sur LUP . This would be devastating but we trust that by working together to uphold the LUP we will be able to continue to provide for both the maximum public access and the best resource protection. The Defense Committee was initially brought together by a concern about the lack of enforcement of existing law prohibiting Short Term Rentals (STRs) in the Big Sur planning area. Please read the Issue Statement. Recent permits for development issued to Ventana Inn by the California Coastal Commission* are inconsistent with the Big Sur LCP and were issued without local review. Yet another example of an action that threaten the preservation and public access goals of the Big Sur Plan. The inconsistencies are absolutely not acceptable. Pleased read more background here. We address these and other concerns as they come up in the following pages. Please keep in touch. We are of course welcoming any comments and/or suggestions for this website. Stay in touch e-mail us CLICK HERE. We have over 250 persons (including former elected officials Sam Farr, Karin Strasser Kauffman and Dave Potter) signed on as supporters of the effort to uphold existing law in the Big Sur Planning Area. * CCC website is currently using a picture of the mouth of the Little Sur River. A picture that illustrates a successful conservation effort and a good representation of what it is that we want to preserve: This and other untrammeled vistas along the Big Sur coast. Memo from Mike Novo former Director of County Planning Dept. E-mail us. with your comments, suggestions, links, etc.